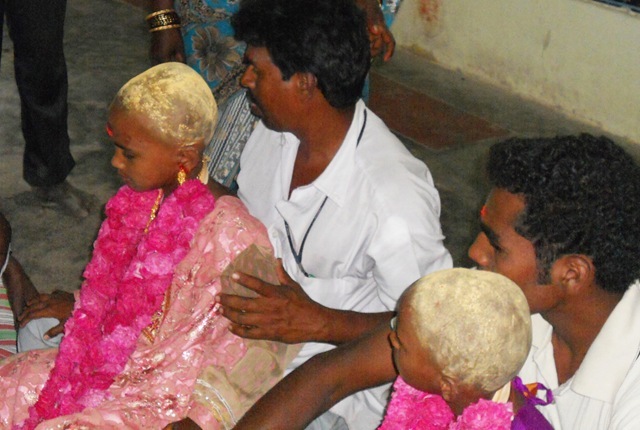 The Tamils of South India have a number of “Rites of Passage” ceremonies. 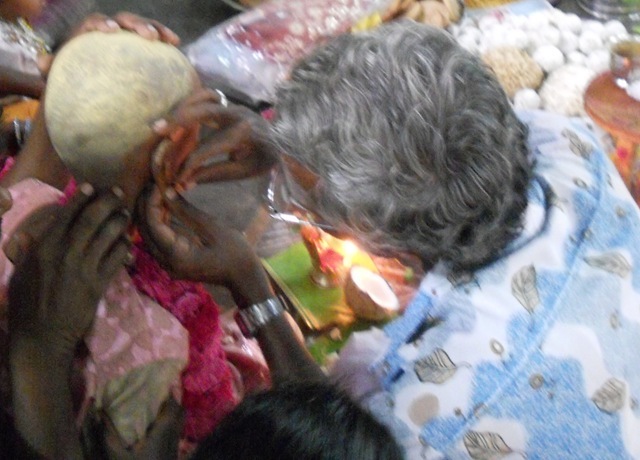 For Tamil girls these include Naming, Ear Piercing and Coming of Age, as well as Marriage and Cremation. 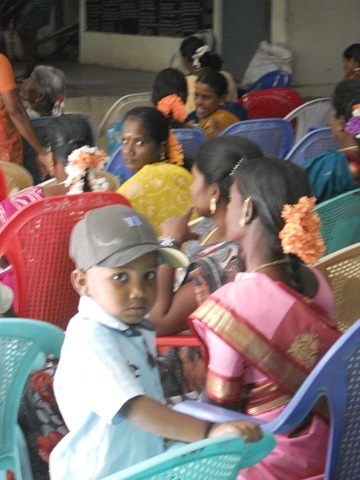 We were privileged to be invited to a Kadhani Vizha (“Ear Boring”) function recently. 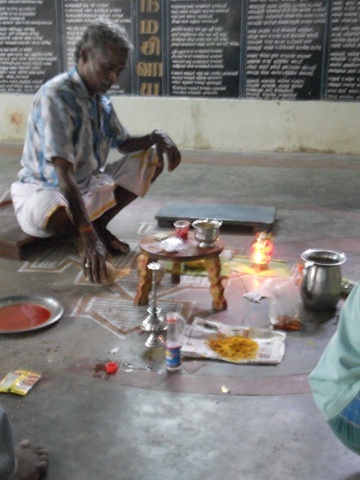 Kadhani Vizha (also Kaadhu Kutthal) is the Tamil name for this ceremony. 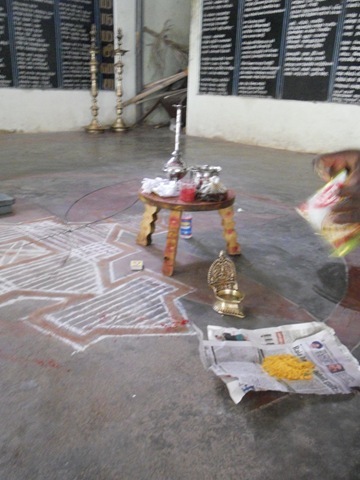 Karnavedha is the Sanskrit name. We took photos so we could show this to you. 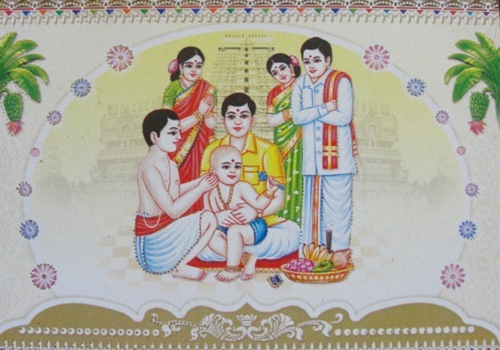 Below is a picture we took from the invitation we received, showing the traditional form of this rite. 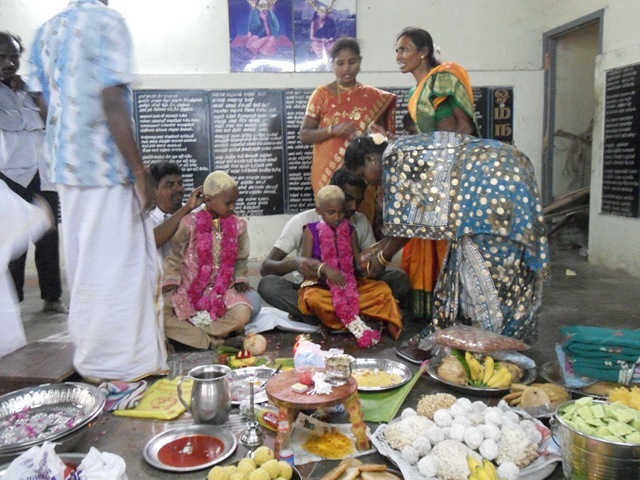 Usually this ceremony is done by Tamils when the girls are three or five years old. 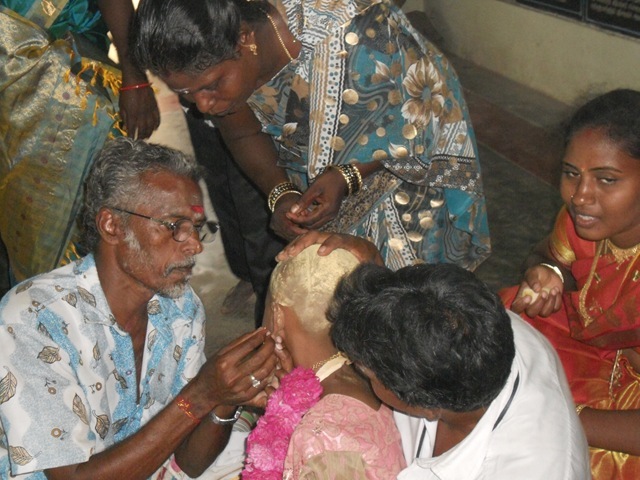 Elsewhere, Karnavedha may be done when the girl turns one. 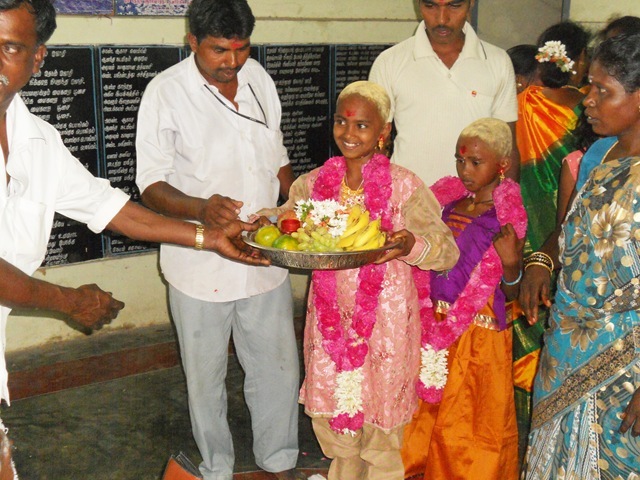 Today’s ceremony honored two sisters, Shusmitha and Swetha. They are quite a bit older than the norm, twelve years old and ten years old, respectively. 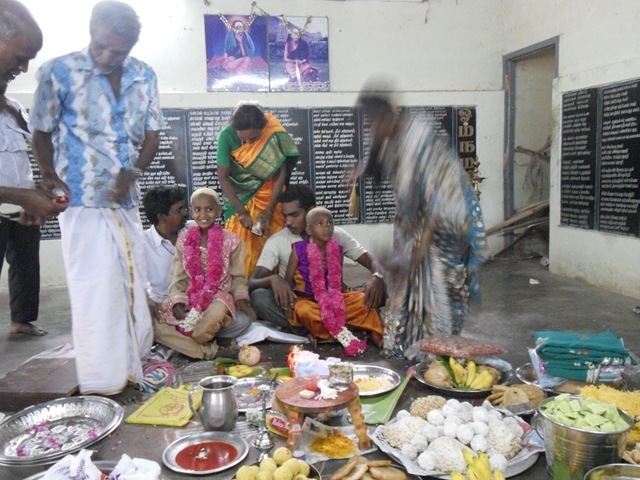 Their mother, Vennila, who did not have this ceremony when she was a child, decided not to have it for her daughters either. 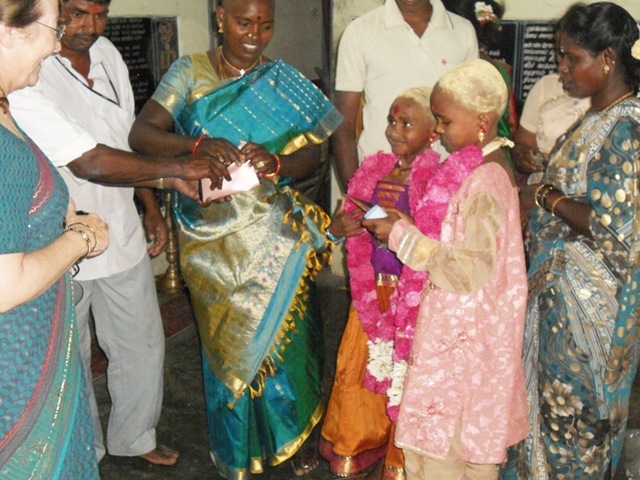 Now her mother, Pushpavathy, decided that it must be done for her granddaughters. So it was done. 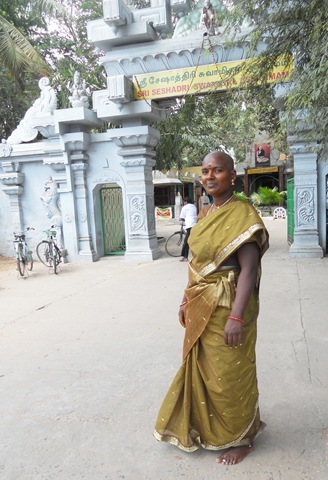 Here is their mother, Vennila, at the entrance to Seshadri Ashram, which is where the rites were held. 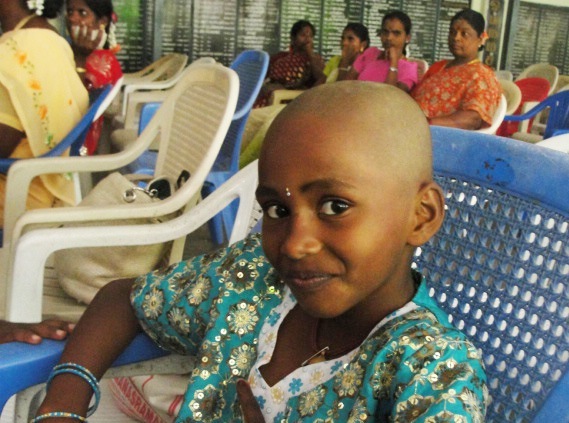 We hardly recognized Vennila with her shaved head. 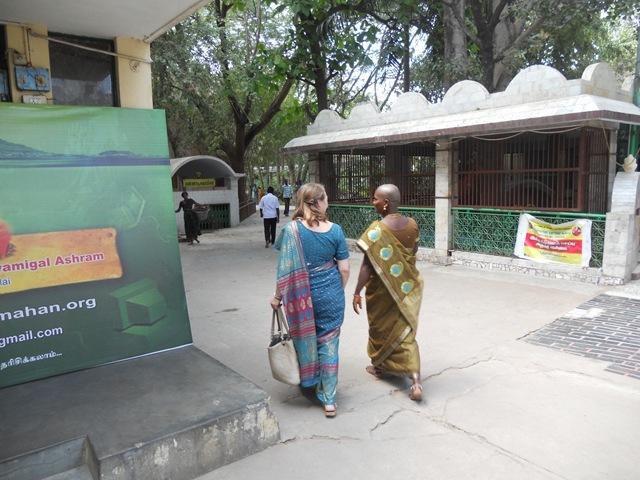 Vennila walks into the ashram grounds with Carol. 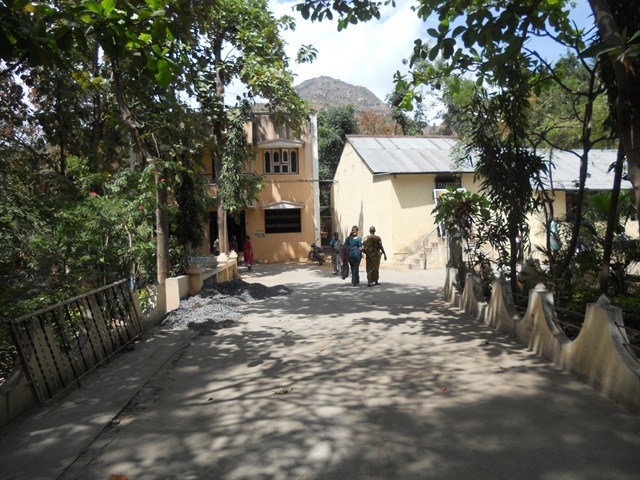 Arunachala peaks through behind the ashram. 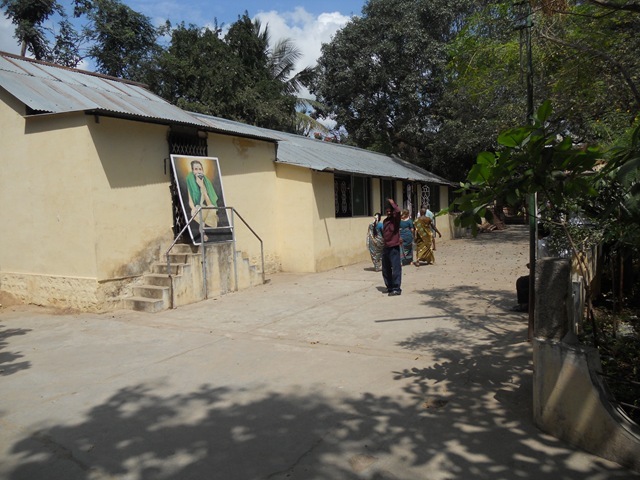 This is the hall in which the ceremony is to be held. 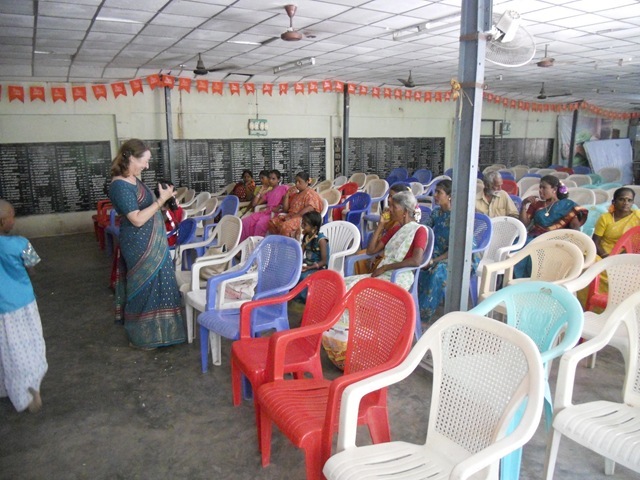 Many chairs are set up. It is 1:30, the scheduled start time. Not many people are here yet. 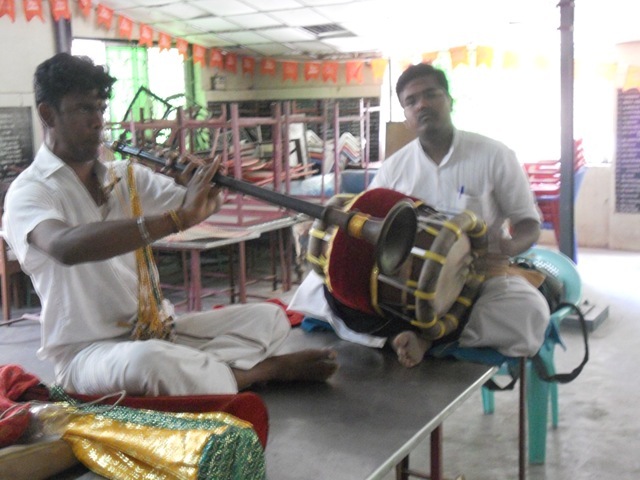 In the back of the hall are two musicians, sitting on a table, playing. They will play all through the rites today. 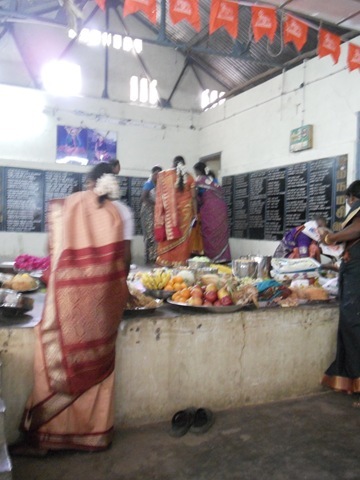 The women are dressed in fancy sarees, with especially pretty flowers in their hair. 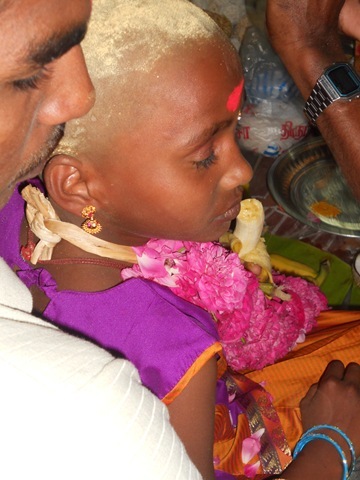 Here is the younger girl, Swetha. 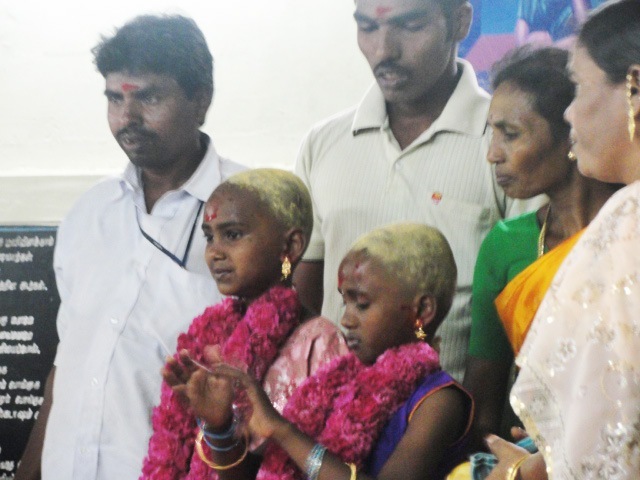 Both girls and their mother have had their heads shaved for this ceremony. 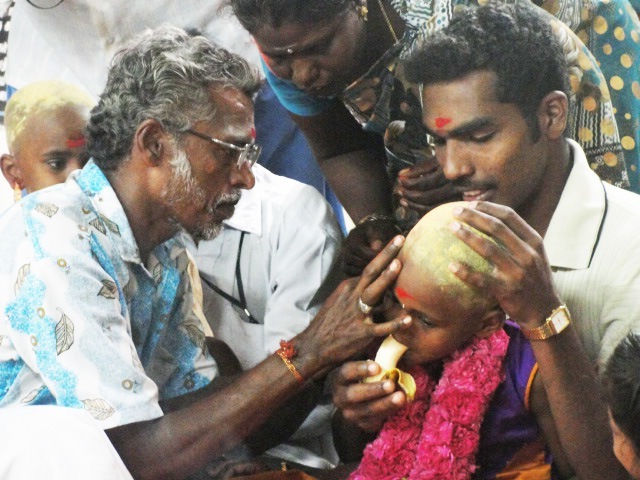 The shaving of the head is seen as a special sacrifice to God. People sitting and waiting. They are pleased to have their picture taken. 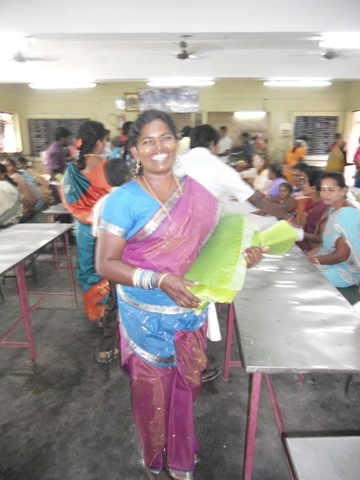 Below is Shusmitha, the older sister (“Akka” in Tamil). Here is Shusmitcha with a cousin. 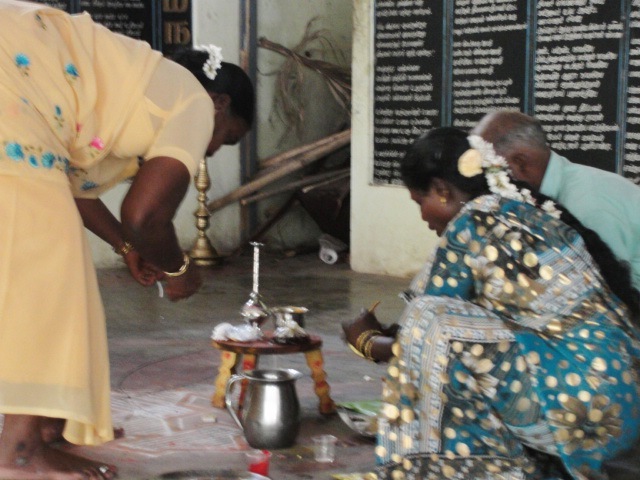 Family women prepare items for the upcoming ceremony. 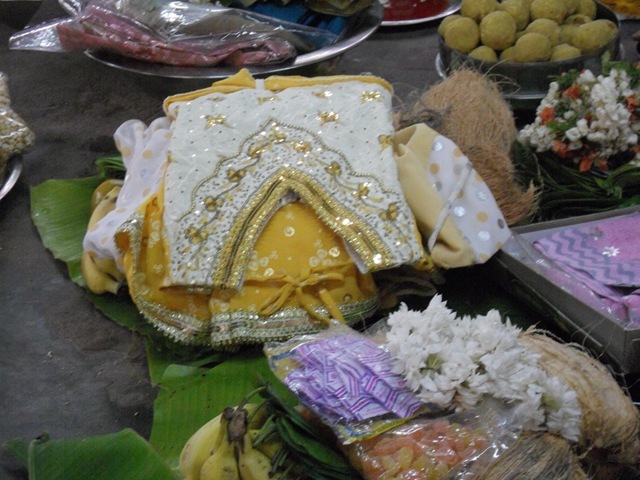 Here are the ceremonial items, most of which sit on a wooden stool. 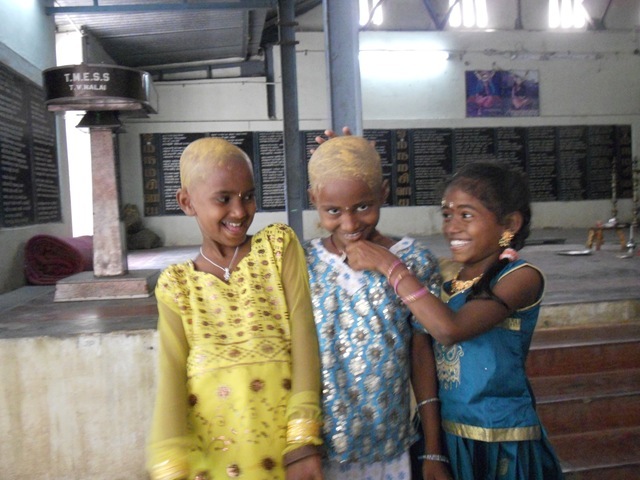 Now the girls both have turmeric rubbed on their shaven heads. Besides its ceremonial use, turmeric is an antiseptic. Here they stand with the cousin. A Western lady, Penny, comes in the door with gifts for the two girls. 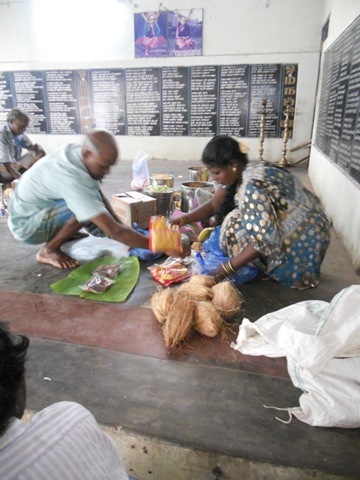 Now various gifts are being laid out, mainly consisting of food and new clothes. 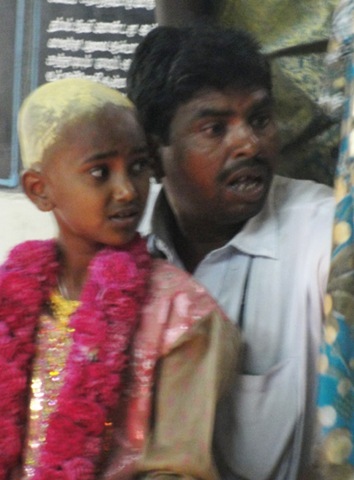 The ceremonial official (the ear piercer, not a Hindu priest) has lit a flame and sits waiting for the preparations to be done so he can do his job today. After some time many gifts are laid out. Doing this preparation takes longer than the actual ceremonial piercing. Here is a pile of new clothes for the girls. 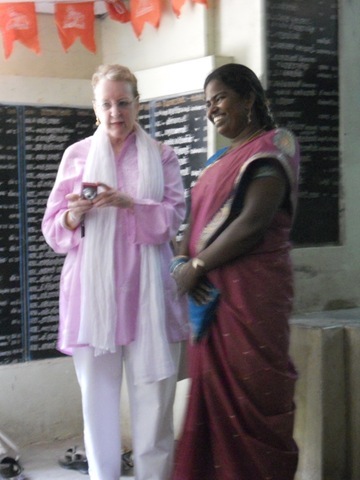 Vennila’s sister, Laxmi, stands talking with another Western woman, Amala. 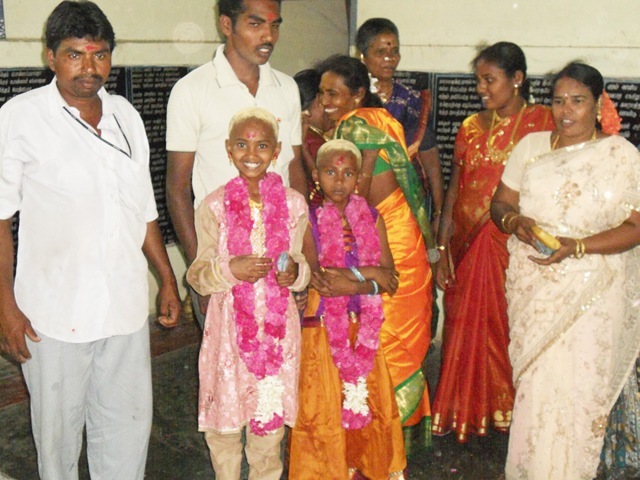 Vennila has three sisters and three brothers. In her generation these large families were common. Now, with the widespread use of birth control, they are rare. 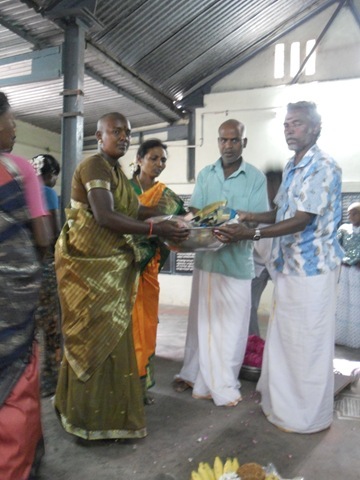 Vennila is receiving a gift of clothes from the men in her family. 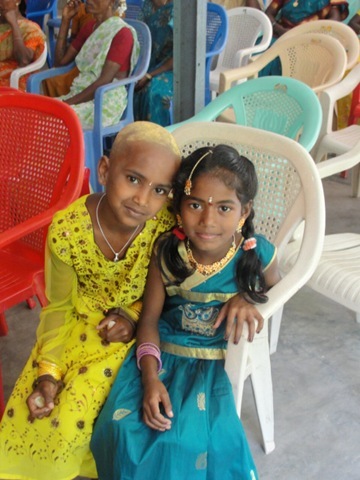 These include new clothes for both girls and for Vennila. They will put them on now for the ceremony. 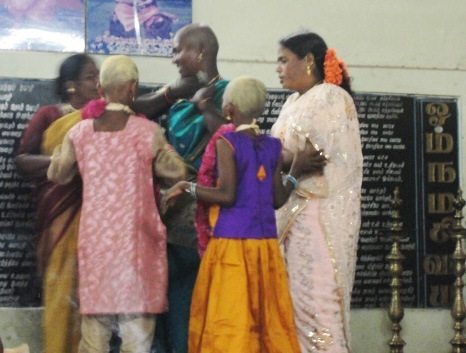 Vennila and Susmitha go behind closed doors to dress. 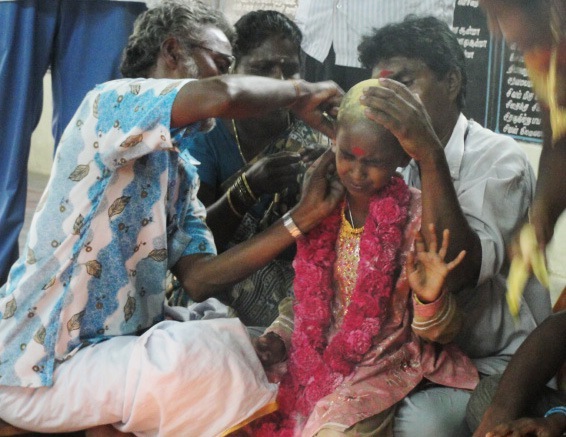 Swetha is being dressed by three of her aunties on the stage. Now the girls are in their new clothes, and standing, ready for what is to come. 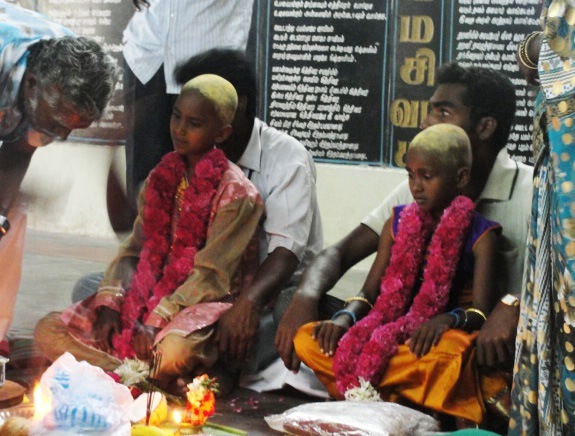 First they receive big flower malas. The flower wreathes are almost bigger than they are. Then they sit in their uncles’ laps. 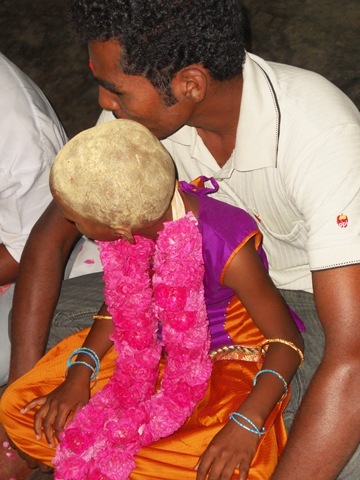 This sitting in a male relative’s lap for the piercing is a traditional element of the ceremony. 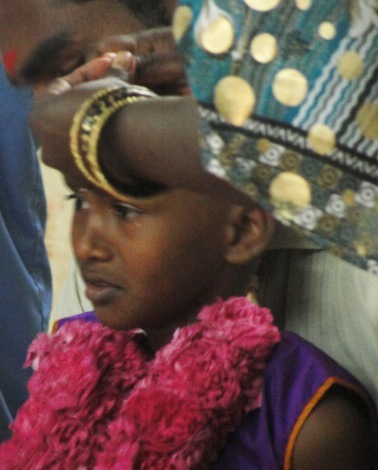 The girls then receive gifts of jewelry — necklaces and bangles. I wonder if they are gold? 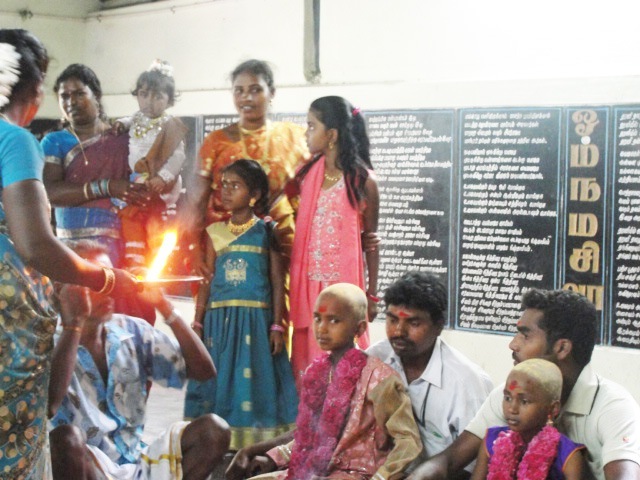 If so, it is an enormous expense for this family, which I know to be pretty poor. Shusmitha looks at her sister. Is that apprehension on her face? 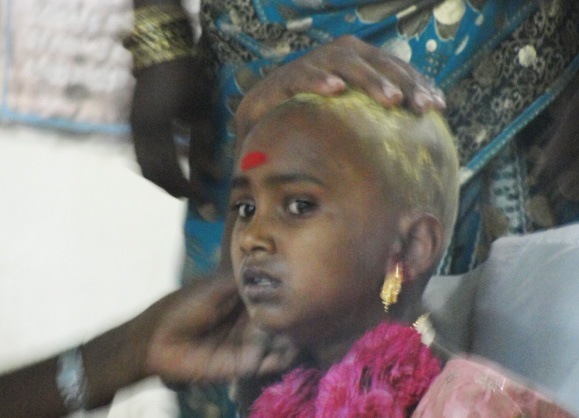 She is the oldest, she will be the first pierced. 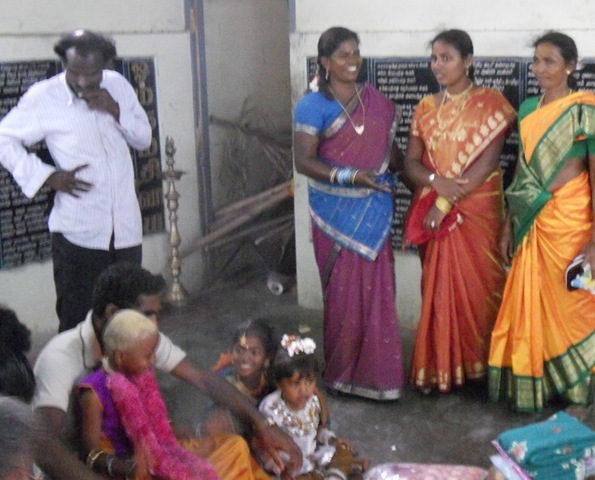 Three relatives stand near, dressed in fancy sarees for the special occasion. The girls sit and wait. 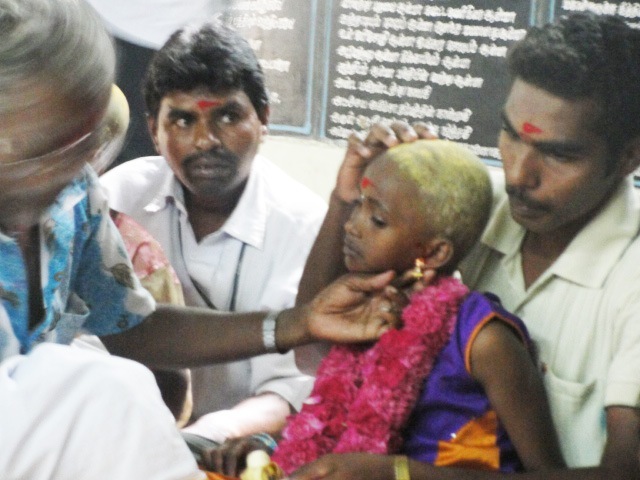 Before he proceeds, the ‘piercer’ will dot their foreheads and each ear with red kumkum. Now is the time. 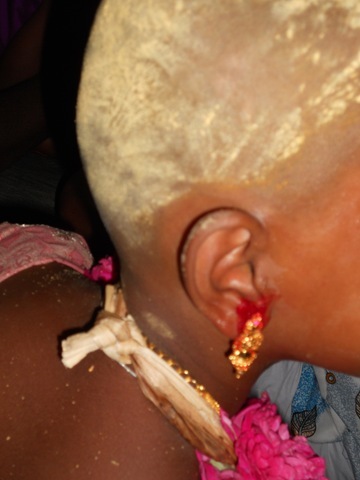 Special earrings are used for the piercing, with long sharp ‘swords’ to go through the earlobes. Shusmitha does not look happy here. They give her a banana to bite into to relieve the pain. Here is the first earring. 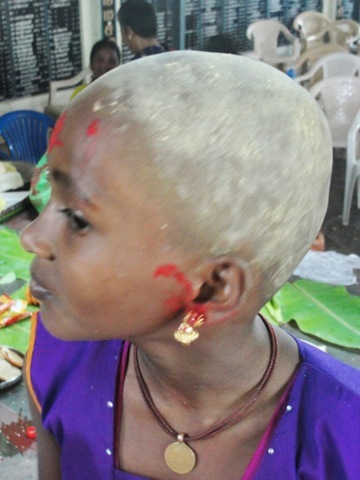 I think the red is kumkum, not blood. One ear done, now for the next. 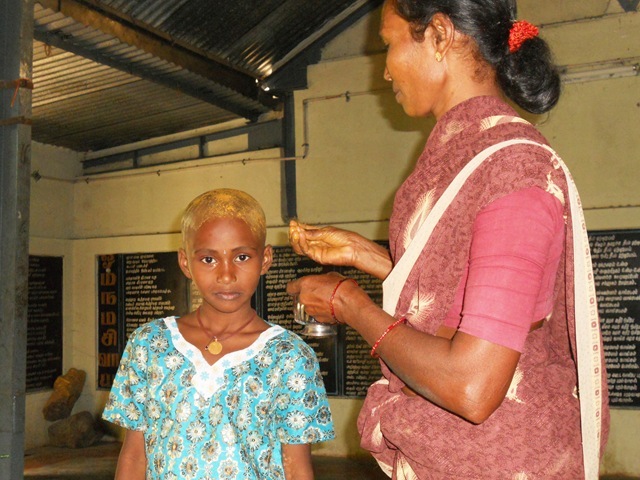 Here is the second earring in Shusmitha’s ear. She is finished! She now sits quietly in her uncle’s lap. Now it will be Swetha’s turn. She looks a bit scared. Biting the banana, so she does not cry out. One ear done, resting before the next. Now both are done, and the piercing is finished. Neither girl cried out. 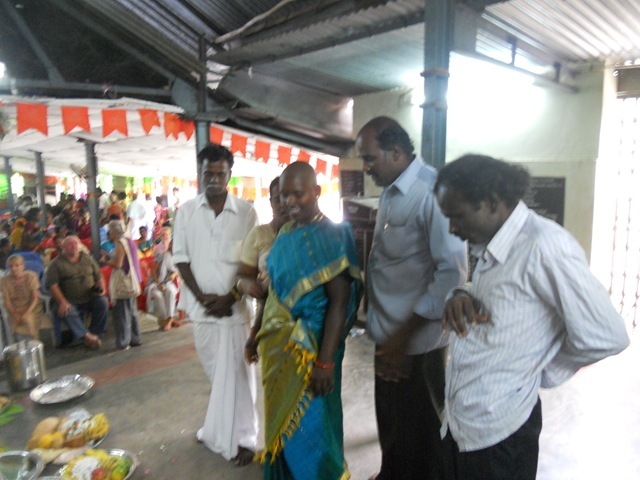 Vennila stands with brothers and uncles, to one side. The hall is filled with people now. About 200 came today to honor this family. Next a camphor flame is lit. 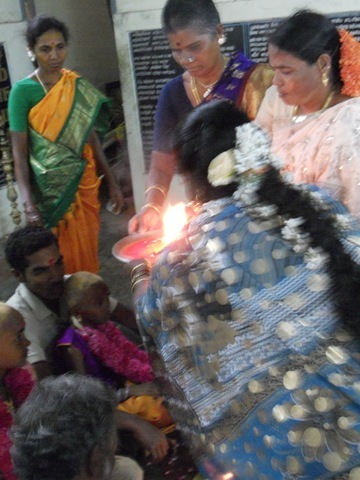 Then passed to the grandmother and two aunties. 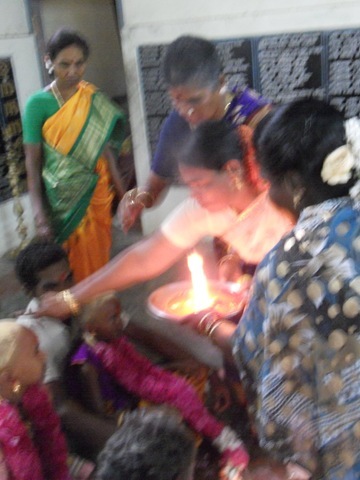 They wave the flame at the two girls, and dot their heads with kumkum. 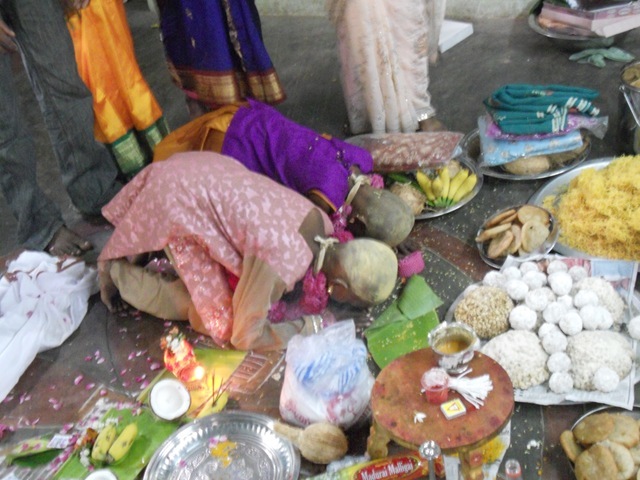 The girls then kneel and pranam, and rice is thrown on them by all who attend. And on with the gifting. 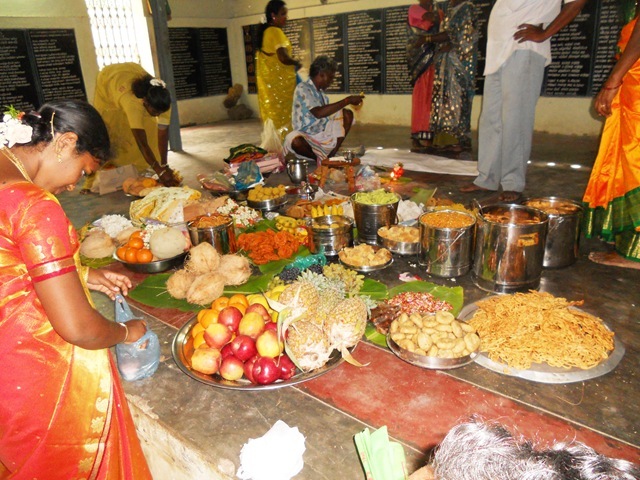 Gifts of food and flowers are given. 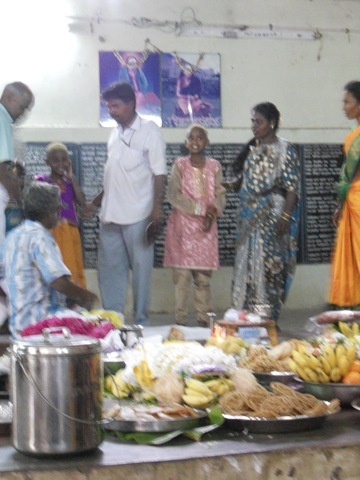 Vennila is with her two girls. She is in a new saree, given to her for this occasion. For any such occasion one big cost is for new clothes. Carol gives the girls a gift. 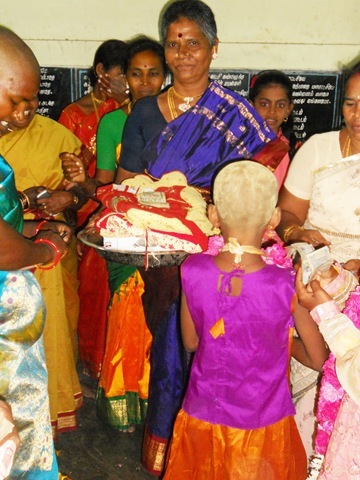 Then the grandmother, Pushpavathy, gives more clothes and a big stack of money. 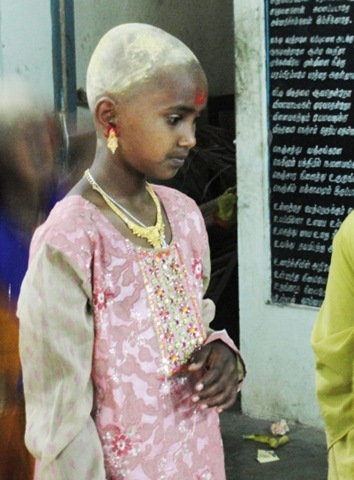 Here is Shusmitha, after all is done, with her new earrings on, as well as the new necklace and bangles. 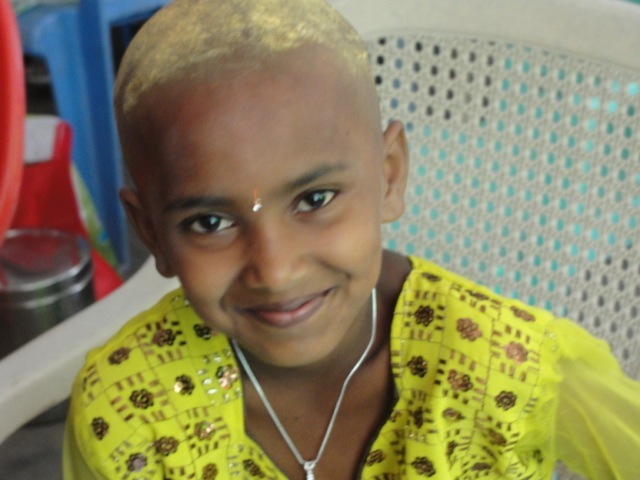 and here is Swetha. It is all over now. Except, naturally, for the eating. After any of these functions food is served to all the many guests. 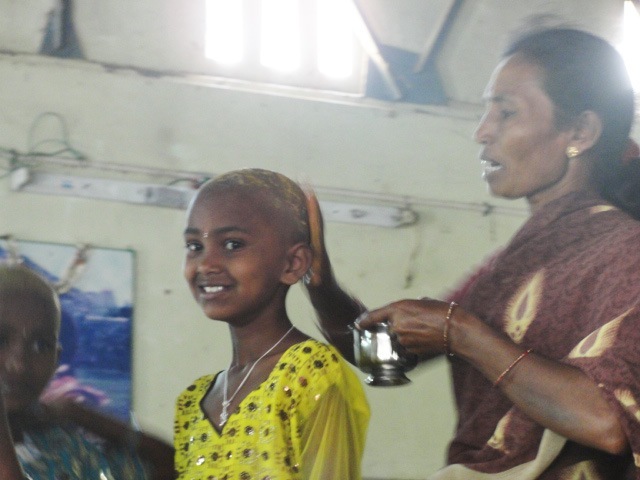 Here is Laxmi, serving us. The serving is done by family, and sometimes friends, too. 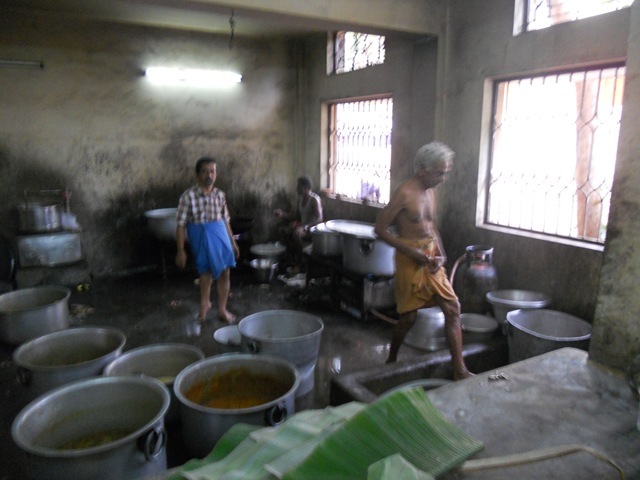 The kitchen is chaotic, with giant pots of food scattered around. 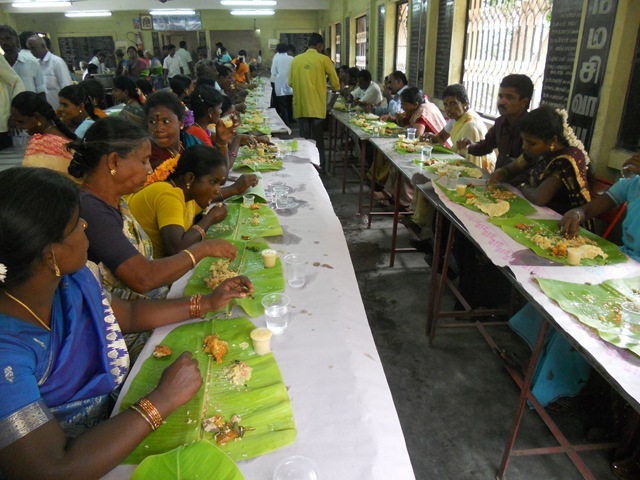 It takes a lot to feed 200 people. 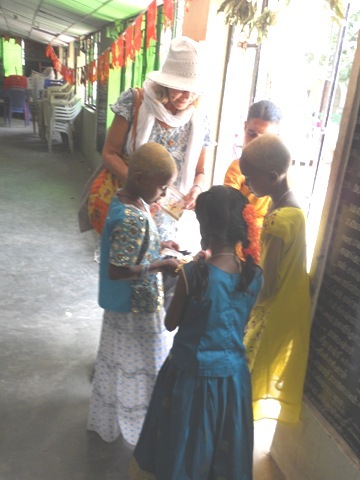 After eating, we wash our hands and head home. Carol and I are both touched by the respect paid to this family by their many friends. I see these Rites of Passage as so important in binding the family together, and making sure that everyone is secure in their place in the family and community. These are things largely lost in the West. 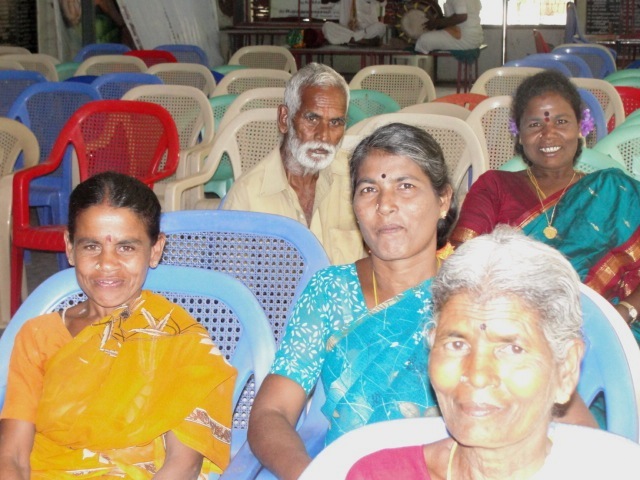 The Tamil family is quite strong. 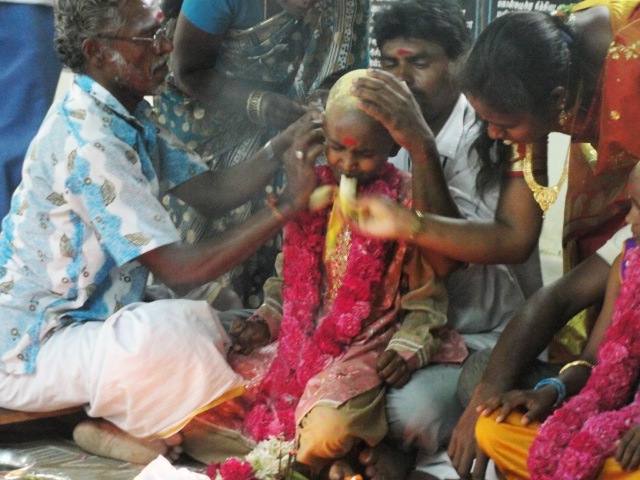 It is ceremonies like this one that help keep that strength. 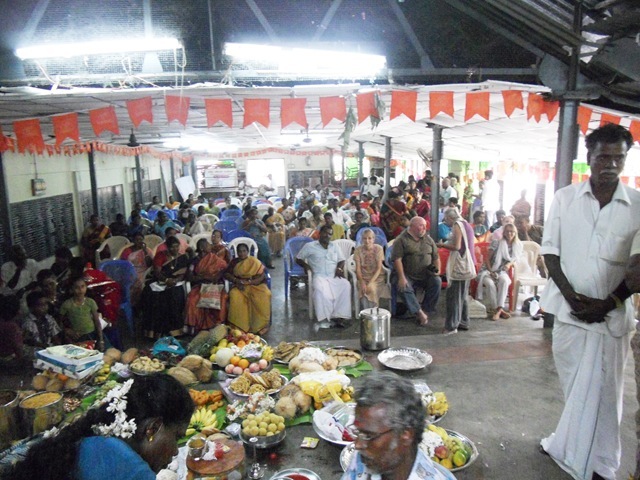 This entry was posted on February 24, 2011 at 4:25 pm and is filed under Arunachala, Festivals, Celebrations and Rites, Rites of Passage, Tamil Nadu, Tamil Women, Tiruvannamalai, Village life. You can follow any responses to this entry through the RSS 2.0 feed. You can leave a response, or trackback from your own site. am a boy but i was also pierced when i was two….i wore even more larger earrings….the most frustating part was that i was not allowed to remove my earring still i was eight….but then i developed my desire to wear it….now i wear small studs to school…but in home i alway wander with dangling earrings !! 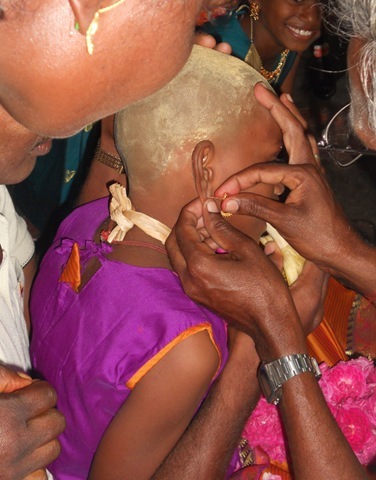 i was age 3 when i got it….i have been born n brought up in Bangalore but to keep to the traditions of our ancestors we went to vellor our village to get my ears pierced 🙂 n get my head shaved! some cute pics n memories still linger around after yrs n yrs! !